The Akwa Ibom state government has accused the All Progressives Congress (APC) in the state of “hijacking” the planned visit of the first lady, Aisha Buhari, to the state. Mrs Buhari is visiting the Akwa Ibom this Friday to flag off her pet project, Future assured, a nongovernmental organisation advocating the wellbeing of women, children, and adolescents in Nigeria. Ita Enang, an aide to President Muhammadu Buhari, while briefing reporters on Thursday, said the flag-off ceremony will take place at the Nsima Ekere Campaign Ground in Uyo. He said about 10,000 youth in the state are expected to receive interest-free loans, grants, and various forms of training from the Future Assured, together with its partners, which include the National Directorate of Employment (NDE), the Niger Delta Development Commission (NDDC), and two senators from the state – Godswill Akpabio and Nelson Effiong. The Akwa Ibom government said the APC was planning to “hijack” the protocols associated with Mrs Buhari’s visit in order to make political capital out of it. The government specifically accused Mr Akpabio, a former governor of the state, of wanting to use the visit to blackmail the state government. 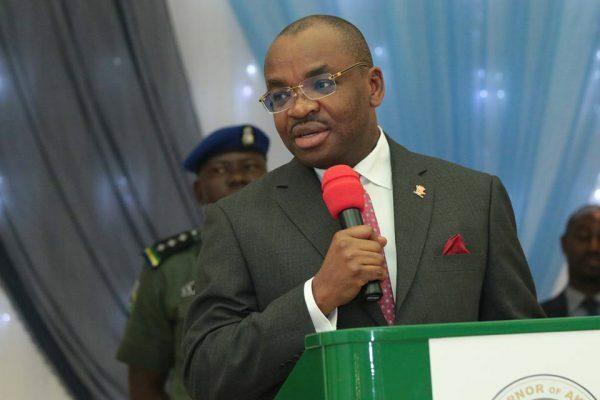 “The struggle for the soul of Akwa Ibom State come 2019 is becoming dirtier,” said a statement forwarded to News Today by the Commissioner for Information in the state Charles Udoh. “The office of the First Lady had written to the State Government informing it of her visit to the state and the government is said to have made adequate arrangements befitting of her status and office. Suddenly, former governor, Senator Godswill Akpabio is alleged to have taken his personal vehicles to the DSS office in Uyo preparatory to the visit of the wife of the president. “We have been rightly informed of this plan by Senator Goodwill Akpabio to deliberately blackmail the State Government by bungling the protocols of this visit, embarrass the State Government by creating a climate of odium and despair and thereafter rejoice over such failure,” the statement said. “We will resist that,” it added. The statement said the president’s wife, irrespective of what she was coming to do in the state, ought to be a guest of the state government and that it was customary for the state government to make arrangement for such a visit. The statement said it was “ironic” for the State Security Services (SSS) to accept to use Mr Akpabio’s private vehicle to ferry the first lady. When Mr Akpabio’s spokesperson, Anietie Ekong, was contacted he declined comment on the matter, saying it was a protocol matter between the presidential villa and the Akwa Ibom Government House. The SSS director in the state, Malam Waziri, said this Friday morning,that the claim by the state government was not true. Mr Waziri said Mrs Buhari, while in Uyo, would be using two of her official vehicles brought in from Abuja. He said the first lady is to be accompanied by the wives of three state governors. The governors’ wives, he said, have also sent in their vehicles in advance. The SSS director said the Akwa Ibom government sent in vehicles too, which would be used in the first lady’s entourage. “You will be able to verify what I am telling you if you will be present at the airport when the first lady lands in the state,” he said. But a source who works as an aide of Mr Akpabio and is privy to the issues surrounding the visit that Mrs Buhari would indeed be riding in Mr Akpabio’s private car – Mercedes S500 bulletproof – when her flight touches down in Uyo. The aide, who did not want his name mentioned in the story because he did not have the permission to speak on the matter, said Mrs Buhari would visit the senator’s country home in Ukana, Essien Udim Local Government Area of the state, after the flag-off of the Future Assured project in Uyo. “We have not hijacked the visit,” Mr Enang was quotes saying, Friday morning while reacting to the state government’s allegation. “We are only providing an enabling environment to receive the wife of the President of the Federal Republic of Nigeria.” Mr Enang said the state government, having been “duly” informed, is obliged to receive Mrs Buhari and also be part of her programme in the state. “APC has not done anything to prevent the governor, his wife, or the state government from receiving and hosting the first lady.” Mr Enang said the flag-off ceremony is holding at Nsima Ekere Campaign Ground because the state government, according to him, refused to grant permission for the use of the Uyo Township Stadium. “They told us the stadium was being renovated,” he said.